You can pick up a Qualcomm quad-core tablet if you’re willing to spend $1,300. Qualcomm takes its chips very seriously. The Fortune 500 Company leads the pack in mobile technology and is renowned for its Snapdragon™ devices. This is a processor that combines wireless, power, multimedia and performance for a superlative experience. The company stands for excellence and it is no surprise that we hear of a Qualcomm Quad-Core tablet. In fact, all through the year there has been constant buzz about the chip and to say that it has been highly anticipated would be stating the obvious and making an understatement, all at the same time! If you’re not convinced by the excellence the company is known for and its sterling reputation, here are a few more things to consider about Qualcomm Quad-Core tablet. If you’ve been awed by stories of the Samsung Galaxy SIII and the HTC One S, you will happy to note that they run on Qualcomm technology. Buying the tablet will mean you get to experience performance and speed like not much else. Your tablet will recognize fingerprints and judge pressure and temperature. It comes backed up by microphones and Surround sound for a great stereo effect. Massive storage of 16 GB, a 13 megapixel camera, a large display screen, 1 GB RAM, 2 GB memory ensures that the device is a win-win across all quarters. Add to all this is the delicious Android 4.0 Ice Cream Sandwich and you’ve got one hell of a product. Reputed technology magazines have ranked the Qualcomm tablet higher than its closest competitors, across parameters. In fact, when it came to platforms, Snapdragon’s SoCor system on chip could even outstrip Nvidia’s Tegra 3 on which many Android tablets run. Additionally, Tegra’s Infinity is 23% slower than the Snapdragon S4. Since the tablet comes with superlative internet speed, pages load faster and the whole experience is smoother, sharper and faster. If you love online games, you will especially enjoy the Qualcomm tablet. Qualcomm did promise a better camera and it has done just that. Better responses, faster image capture, quicker recycling- it is all good news for the photography enthusiast in you. The technology to do all this is mind-boggling but suffice it to say that even if we don’t know the amazing work done, we do know a good product when we see one. Thank God we have another, serious contender in the market, making our shopping for tablets more fun. This means a less monopolistic situation and that’s great news! What one hopes for with the new Qualcomm Quad- Core tablet is superior real-life applications, smoother user-interface and a quick, responsive device. Going by the looks of things, we should not be disappointed. 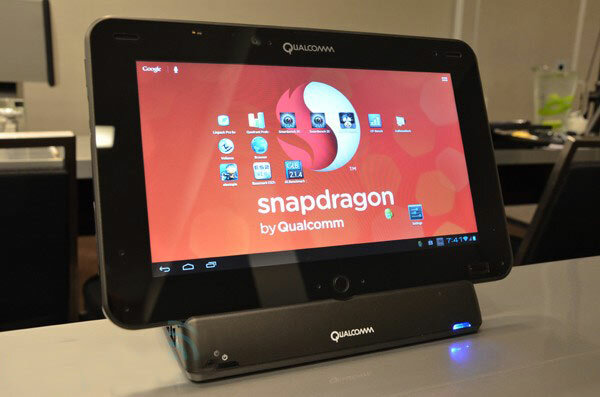 Qualcomm’s new Snapdragon S4 APQ8064 chip is not available in any consumer devices yet, but if you’re willing to pay a premium for a tablet aimed at developers, you can pick up a 10 inch Qualcomm Quad-Core tablet with the newest processor for $1299.